While I was in undergrad in San Francisco, my girlfriends and I had a favorite restaurant. It was called Pasta Pomodoro. This became our go-to establishment. Celebrating passing a final? We went straight to Pasta Ps! In need of girl time after a breakup? Pasta Ps was our first stop. Literally, give us any reason to go and we were game. My favorite thing about this restaurant was their signature dish. PASTA. POMODORO. (I mean really, could ithave been anything else?) It was simple, flavorful, healthy-ish and filling. Five years later (or maybe 15….who’s counting? ), I decided to recreate one of my favorite college food memories. Let’s just say I knocked the ball out of thepark. Real talk: I ate most of this dish before I was even done with thephotos. It was that good! To make this memory come to life, we partnered with our friends at Barilla — an Italian family-owned food company that makes pasta and sauces. 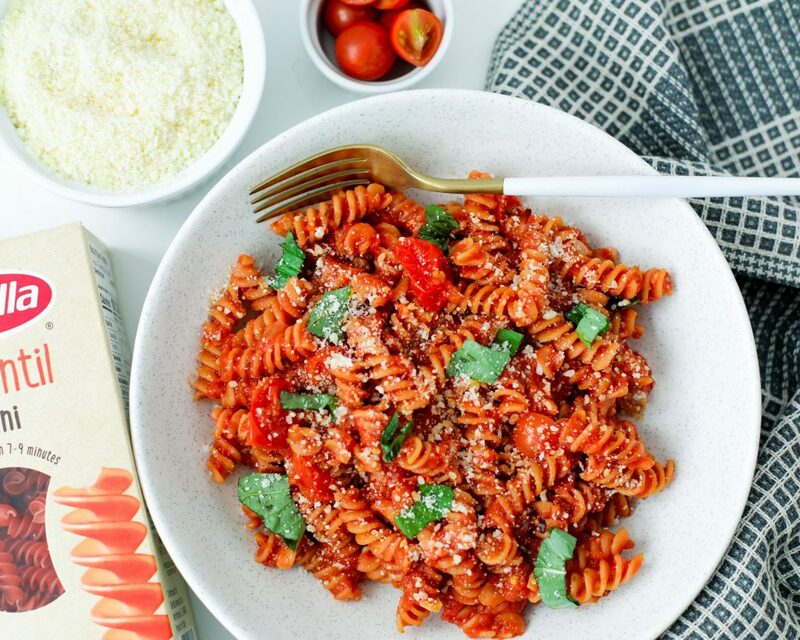 We used their new chickpea and red lentil pasta line, which is gluten free and made with just ONE simple ingredient:legume flour. For this recipe, I used the Red Lentil Rotini, made with (you guessed it) red lentil flour. This line is great for people avoiding gluten, or even our vegetarian and vegan besties gluten-free looking for more protein. Each serving of pasta provides a good source of plant-based protein and an excellent source of fiber. Ready to give this one a try? Here’s what you do: Start by chopping the garlic and onions, and then slice the cherry tomatoes in half. In a food processor or blender, puree canned tomatoes. Next, heat the olive oil on low-medium heat in a medium-sized pot. Add the onions and cook for 2-3 minutes. Once that starts to smell nice, add the garlic and cook for 3 minutes or until fragrant. Add the chopped cherry tomatoes, crushed red pepper flakes, oregano, and a pinch of salt, then stir. Reduce heat to a simmer, cover and let cook for about 25 minutes or until the sauce thickens. Meanwhile, cook the entire box of pasta according to package directions (boil 4-6 quarts of salted water. Add pasta and boil for 7-9 minutes). When the pasta is done cooking, drain and mix with the sauce. Add more salt to taste and top with grated parmesan and chopped basil. BON APPETIT! What about you? Do you have a favorite college food memory or restaurant?? Let us know in the comments below. 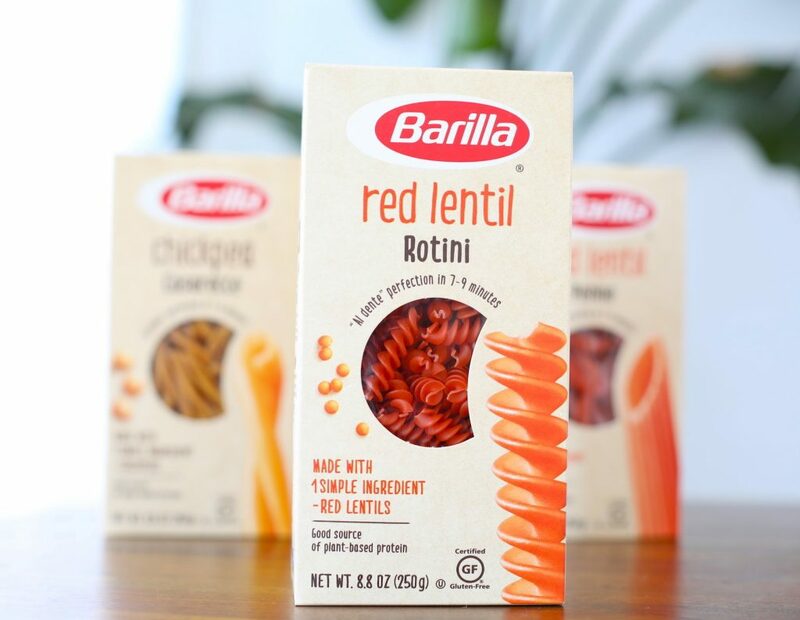 And if you’re interested in trying theBarilla Chickpea and Red Lentil pastas, you can find them on Amazon. Start by chopping the garlic and onions. Slice the cherry tomatoes in half. In a food processor or blender, puree canned tomatoes. Then heat olive oil on low-medium heat. Add chopped cherry tomatoes, crushed red pepper flakes, oregano, and a pinch of salt, then stir. Reduce heat to simmer and let cook uncovered for 20 minutes or until sauce thickens. Meanwhile, cook the entire box of pasta according to package directions (boil 4-6 quarts of salted water. Add pasta and boil for 7-9 minutes).